Our guests make our business successful and we love to share their stories. Please read our vacation rental guest reviews and you will know you made the right choice to book with Vacation Rental Authority. Management was very responsive to one problem that we had. The team is WONDERFUL ... the right touch of warmth and professionalism. Thank you, team members. You're an important part of why we love reserving our vacations through Vacation Rental Authority. It's a beautiful home . . . wonderfully decorated, very nice/comfy beds throughout, located right on the lake with its own pvt beach and dock. The home and location met all of our hopes and expectations. We'll be back to Coeur d'Alene for sure! Your team went above and beyond to help us save our vacation. Thank you! VRA saved our vacation. After booking a different site through a different agency, our plans fell through when the home was in severe disrepair and uninhabitable. VRA responded on a SUNDAY! We feel really blessed to have the place where we stayed and they were great to work with. We had a great family vacation and just stayed at the cabin and played on the lake. The deck on the home is a great gathering spot for games, reading, and relaxing. 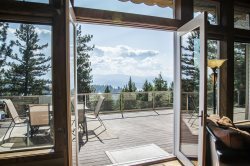 If a lakeside cabin with a dock and room to spread out is what you are looking for, then this place is perfect. Great relaxing place that had all the amenities that we needed for our family vacation. Very professional management at Vacation Rental Authority. Excellent property capable of hosting multiple families. The scenery and views were amazing - we also had turkeys, deer, and elk in the yard during our stay. The beds were very comfortable and the amenities were above our expectations. Very professional service with arranging stay. Marissa was great. Full of information, responsive to questions and requests. See above. We've started to look for next year's family vacation and there was an immediate suggestion to return. We might, but need to do some homework first.